Sample Delivery Date - This is the date for which you intend to deliver your sample. 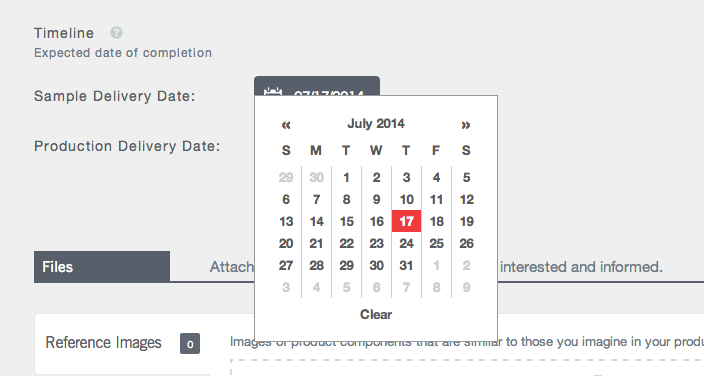 Click onto the element and you will have a calendar element pop up. A sample is a physical prototype of your product that you make adjustments with before moving forward. This is a great blog post on 'Why You Need a Sample'. Production Delivery Date - This is the date for which you intend to complete production of your product. Typically, factories have a minimum 4 week lead time to produce once all materials are in place and delivered. Best practices, suggest that a 6 to 8 week lead time after your sample delivery date is ideal. You can select each date by clicking onto the calendar. I've gone ahead and selected my Sample Delivery Date for July 17th and my Production Delivery Date for October 1st. Remember just like anything else this is auto-saved, and is something you can always change before sending it out to factories. In no way are you committing yourself to that date by selecting it. Follow us and find out how to best use our 'Files' section. Continue.